It’s festival season throughout much of North America and Europe, and I was going to say it’s festival season across China as well, but that would only be part of the story: Festival season, lately, has been happening multiple times each year. In recent years, with “explosion” being a massive understatement, it’s hard to know when the season ends (festivals used to be limited to the holiday weekends of Oct 1 and May 1). Between late July and early August I know of the following festivals: 2011 Ocean Midi Music Festival, Ark Beach Music Festival, the InMusic Festival, Zebra Beach Music Festival, Rock Aid and the Da Ming Palace International Music Festival. There are others, but it’s nearly impossible to keep track. 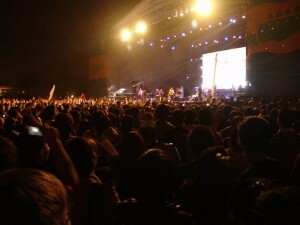 Many point to the proliferation of music festivals across the country as a sign that things are looking good for yaogun. An important half truth at the very least: Music festivals – or, more accurately, events with the word ‘festival’ in their name – are, indeed, an increasing occurrence around the country, especially as local governments have come to see value in backing such events. Festivals make both a good and bad model upon which to base a judgement on the rock scene, because, like the scene itself, looks are deceiving. Just as it takes more than a proliferation of bands to make a vibrant and internationally-ready rock scene, there’s more to a Festival Scene than an increasing number of stages under the banner of ‘festival’. And an increasing number there certainly is: Check here, at the encyclopaedic Rock In China, for a list of many recent festivals. Some recent highlights include: The short-lived Beijing Pop Festival, which brought an increasingly significant lineup of international acts, culminating with Public Enemy, Nine Inch Nails and others in its final, 2007, event. Record label – and, many would add, PR agency – Modern Sky has an eponymous festival as well as the Strawberry Festival and a folk festival in various locations across the country. The Zebra Festival emerged in 2009 in Chengdu and has plans for expansion (in 2010, the fest went to Hangzhou; 2011 saw a Shanghai version). The Midi Music Festival, most often referred to as the leading festival light of the country, has long outgrown the campus of the eponymous music school where it began in 2000, with events outside of Beijing beginning in 2009 and expanding rapidly thereafter. Each festival has had, and continues to have, its own challenges to overcome both from outside – the unpredictability with which the authorities limit the events, for one – and inside – organizational chaos leads to festivalian chaos – though anyone beyond industry insiders would be excused for seeing nothing but good news: The festivals look right and get great coverage in the local and international media. But artists, staff, volunteers and observant attendees (and I have been in all of those categories) run into elementary problems of the type that shouldn’t exist at this level. It’s not that the glass is half-empty, it’s that it’s hard to know what kind of cup we’re talking about, and what kind of liquid (if a liquid at all) is being poured (unless it’s being drained). And the more pouring that gets done, the tougher it is to get the stuff to go into the glass. Over the course of the millennium’s first decade, a number of festival attempts were made, to varying degrees of success. There were the non-festivals, like 2003’s First Annual Lattetown Music Festival, named for the condominium complex (one of a million ridiculous real estate development names in the country) in the southern outskirts of Beijing. Metal bands Suffocate and Spring and Autumn joined pop-punks Reflector and grunge guy Xie Tianxiao and others celebrate the condo’s opening. “We’re trying to show that Lattetown is a fashionable and modern place,” said one saleslady charged with handing out pamphlets that day to the mix of rock fans confused over the setting and nouveau riche confused as to why their search for a new house had to be so loud. There was 2005’s cryptically dubbed “Carnivalesque Party of 1 vs. 120,000”, part of the International Beach Tourism Culture Festival, in the small city of Beihai, in southeastern Guangxi province that combined rock performances with a bikini competition. Soon thereafter was the Gegentala Grasslands Music Festival, which seemed to be a decent enough festival with good potential for a future, but was revealed to be an attempted cash grab by a Sichuanese strawberry magnate. The trip out to the Inner Mongolian grasslands looked like it would be worth the ride until the supposed seven-hour ride became, for many, a twenty-hour nightmare; word was unpaid bills nearly stopped the music on several occasions. Gegentala, Part II was not forthcoming; meanwhile lodging and food prices had been inflated to the point of comedy. What’s interesting about the current situation – in which one estimate claims that 2010 saw as many as one hundred festivals; all indications point to an increase in 2011 – is how suddenly it all seems to have happened. Which isn’t exactly the whole story: The festival era didn’t begin with the Midi Festival, and what’s more, despite appearances, things haven’t come all that far. In 1990, then-new-Beijing resident Udo Hoffmann put together what he says is the country’s first festival. News of the event got to a city official who said that ‘hell had opened its gates’, so it wasn’t a huge surprise that his Hoffmann’s second attempt – for which, he says, five thousand tickets were sold – was cancelled two days before the event. He learned from those first events, though. In 1993, he started the Beijing Jazz Festival; the event lasted through until 2001. Hoffmann was also behind the Heineken Beat festival, held in Beijing in 1999, 2000 and 2001, it was the first large-scale international festival in the country (the lineups for the Jazz Festivals and Heineken Beat are here). 1990’s 90 Modern Music Festival was a two-day event featuring Tang Dynasty, Ado, The Breathing, 1989, Cobra and Baby Brother (Baobeir Xiongdi) at Beijing’s Capital Gymnasium that was said to have drawn eighteen thousand spectators. In a similar vein was the New Music China Xinxiang Concert, for which Huang Liaoyuan brought nine bands – via a “rock and roll train” full of musicians and fans – to a stadium in the small city in 1998. 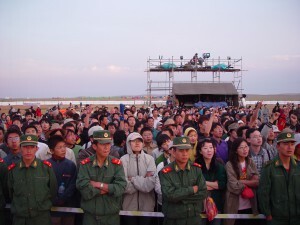 Six years later, he put together the Helanshan Music Festival alongside a motorcycle festival in the desert of western Ningxia. Other than the hard-to-reach venue, the reviews were positive. 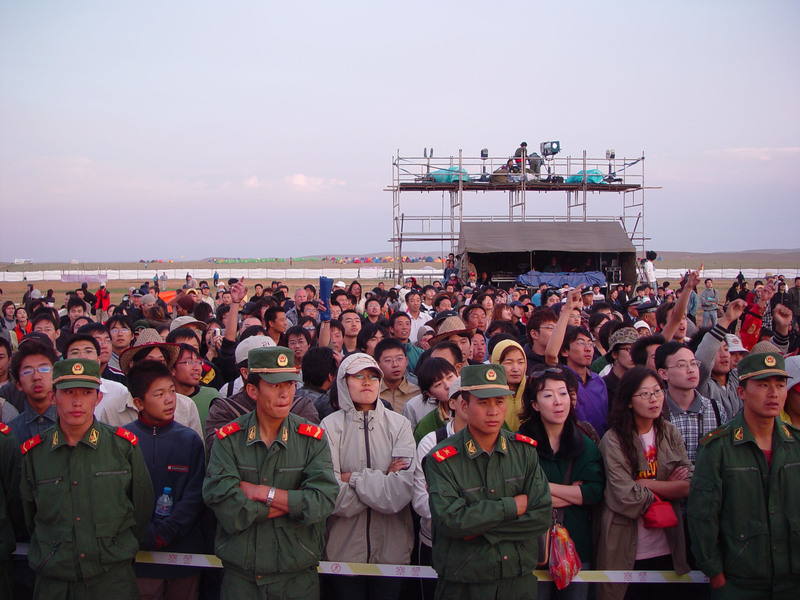 2002’s Snow Mountain Music Festival, held in the southwestern corner of the country, nearby the once-mythical and recently-official Shangri-La, was supposed to be the Chinese Woodstock that everyone had been waiting for. With Cui Jian as the festival’s artistic director, the international media certainly played it that way, but the rainy season and the far-flung locale kept the audience numbers low. Episode two wasn’t until five years later; subsequent installments went further away from rock. 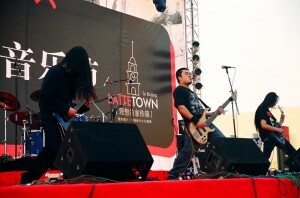 In the first years of the nineties, filmmaker Sheng Zhimin (whose 2009 Night of an Era [再 见乌托邦] is a fantastic look at the nineties’ rock scene), like many current festival organisers, was approached by a local government official who was told that adding a rock component to an otherwise unsuitable-for-rock event would be great for local business. His ‘festival’, which took place inside a (working) roller coaster in a Beijing suburban celebration of Chinese New Year, was put together with not much more than his personal connections to local bands and the dreams that he and his crew had from watching Woodstock videos. The situation would be laughable if one didn’t appreciate Sheng’s deep sense of mission. What is laughable, though, is when one is confronted with the possibility that not much since has been learned. The governmental support that abounds these days – it is a shocking thing to behold – is one of the reasons that it’s easier for festivals to flourish. “As long as the musicians are healthy and not opposed to the Communist Party, why not let everyone enjoy the rock and roll?” Li Xuerong, secretary the local Communist Party Committee for Zhangbei, the site of the InMusic Festival, told the Global Times. Li’s comments represent the feelings of many a local government official eager to put their own towns on the map, and, for now, are convinced that music festivals help them do that. Multiple-year deals between local governments and festival organisers have been signed, a trend that looks to continue as long as it appears that the festivals are adding to the image of the locales in which they are held. On the other hand, festivals are still battling the cultural obstacles of a nation new to the idea of massive outdoor events. “People go to restaurants – they don’t even really go to bars,” Liu Chang, a Midi School graduate who has worked on the Midi Festival since 2007, says. “Most people who go to the festivals probably have no knowledge of the music or any band. To them it’s a simple gathering.” Liu Chang’s boss, Zhang Fan, knows this to be true: “Fifty percent of (the audience) aren’t necessarily coming for the music,” he was quoted, in 2006, as saying. “They’re just coming to have fun.” While there are certainly a few fan favourites, the overall idea was that you could go to the park, hang out, and maybe possibly see some music you’d like. “For the festival-goers, half of the time is spent wandering around,” he told a China Daily reporter in 2007. “The festival is not only performances but rather, a relaxed lifestyle.” Add to that the far-flung locales festival organisers are now exporting to, and you have an audience comprised of a large number of locals just trying to figure out what the heck is going on in their hometown. If people are attracted to a music festival for any reason other than music, we are not talking about an event that gets filed in the same category as Boneroo, no matter how many people are in attendance – and that number is impressive – or how many stages may dot the grass fields of any given park in the Kingdom. And one ought to look critically at who is standing upon these stages. I knew I’d been seeing the same names year after year, but it came home after a quick survey of Midi Festival lineups from the past dozen years. Miserable Faith and Yaksa have appeared at twelve Midi Festivals; AK47 and Brain Failure at eleven; Twisted Machine and Sand, ten; Subs seven; Ruins and the Verse (six). Here is not the venue for debating these bands’ worthiness for the stage. But it is the venue for questioning the variety in the lineups of the country’s leading festival – and, by association, the country’s other festivals, who are all picking from the same limited pool. When festivals go looking for the local Big Guns, they don’t stray far from that list. There is Cui Jian, the biggest star in the country; Xie Tianxiao, who is being tagged as Cui’s successor. There are a few others, who straddle that line betwixt yaogun and pop: Wang Feng, He Yong, Zhang Chu, Xu Wei, Tang Dynasty, Zero Point, Heaven. What one hopes is that festivals live up to their potential, and bring yaogun with them. What one fears is the triumph of the status quo: The same bands headlining the same events plagued with the same problems. Well said and very interesting to read John! This process takes time and spending scarce resources to present a sophisticated lineup might not be the way to sustain a festival in this market.. Instead, if perhaps the presentation, the production and the ‘festival experience’ is improved, it could give the bands of this ever unchanging lineup the best chance to shine and increase their still ridiculously small fan bases.. Thanks for the comment Laurenz. I agree that a changing lineup is not the only thing that’s going to bring more people. But it’s something that needs to be addressed. Even uninformed observers — those interested in the idea of attending a festival for any reason — might wonder about the attraction of a festival that looks pretty much the same year after year; informed audiences, no matter how much they love their bands, will, and do, too. I worry about the fact that there are far more stages going up than quality bands to fill them, and the repeated “headliners” at Midi is a symptom. My hope was always that instead of adding MORE — stages, sites, capacity, etc — festivals might actually contract to a manageable size to focus on the strengths (Roskilde didn’t start with 100,000 people, neither did Glastonbury). But in these days of light-speed development, I don’t see it happening anytime soon. It’s not about sophisticated lineups either, like you say. The market is tough. Bottom line: Like you, I’m all about the Experience. But a festival organization can’t build that kind of Experience if it’s spread too thin.